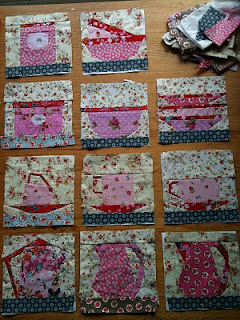 Today a few pictures of the first patchworkquilt I'm working on. I started after visiting a quilt exhibition two years ago. 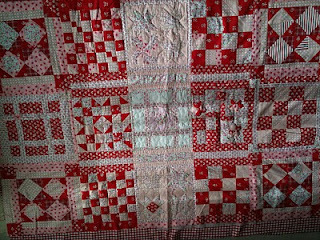 I was impressed by the works I saw and bought a book, Quiltpatronen (quiltpatterns) by Davina Thomas, and a few pieces of fabric. On our trip in may that year to Denmark I started, by hand, making different blocks. Together with my little girl, concentrated on our work. At the end of our trip I finished a few blocks, but had no idea how to combine them in one quilt. Now, one and a half year later, I'm quilting the sandwich, still by hand. It takes a lot of time but I like the result. 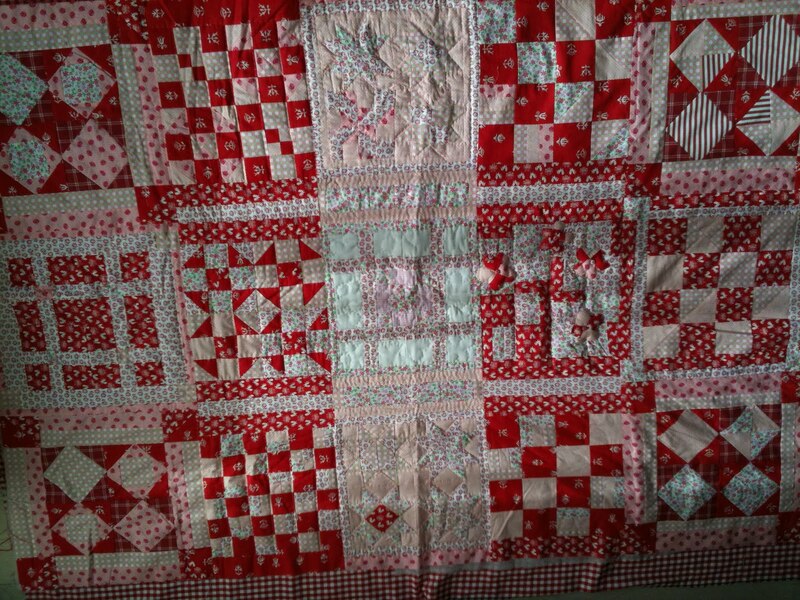 There are about 8 big blocks to quilt... to be continued! 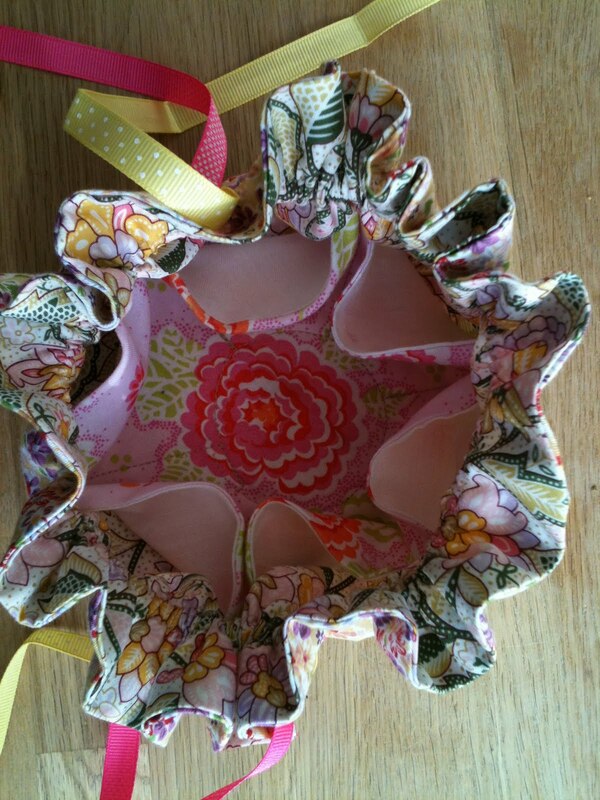 Today I made a new block, this time a little cup with two saucers. Isn't it a cutie? So this is number 12! 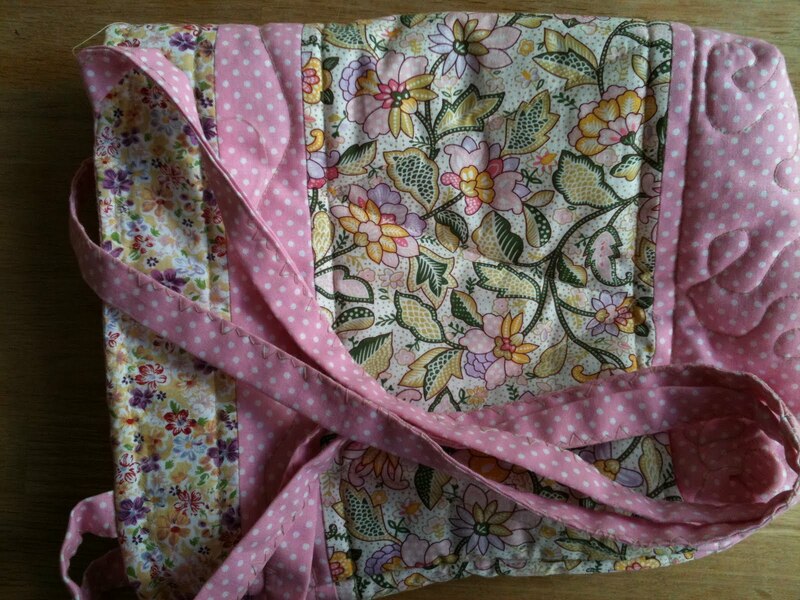 It's raining again, so plenty of time to make two pillows for my eldest. The blue fabric was a curtain in former days, in the room of eldest, which name starts with F (you see, it's upside down; I can't get the picture in the right way, not only a quilt starter, also a blog-newby!). When we were on our trip to Denmark last may I started something new: paper piecing. My mother gave me a book (Paper Piecing by Maaike Bakker) and I just started to cut and sew. 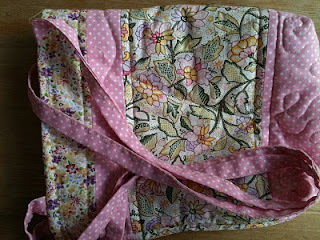 sewing by hand in our holidayhome in Denmark - can you see the sea outside the window? I don't know yet what I'm gonna do with the blocks, but I really like them! 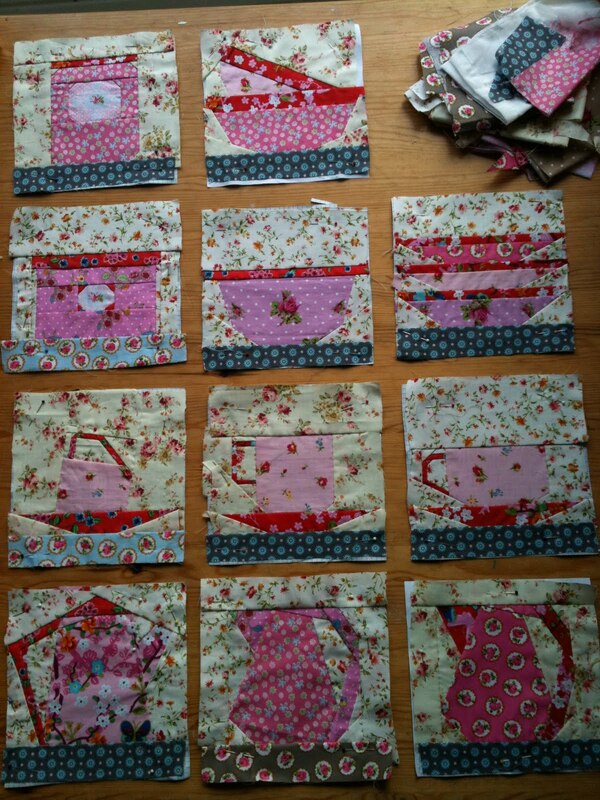 I chose patterns of crockery and use different pink and red flowerprint fabrics. Thanks to the tutorial of Rachel Griffith. Also seen on the internet: thanks to Penny's tutorial. Isn't is a nice couple? 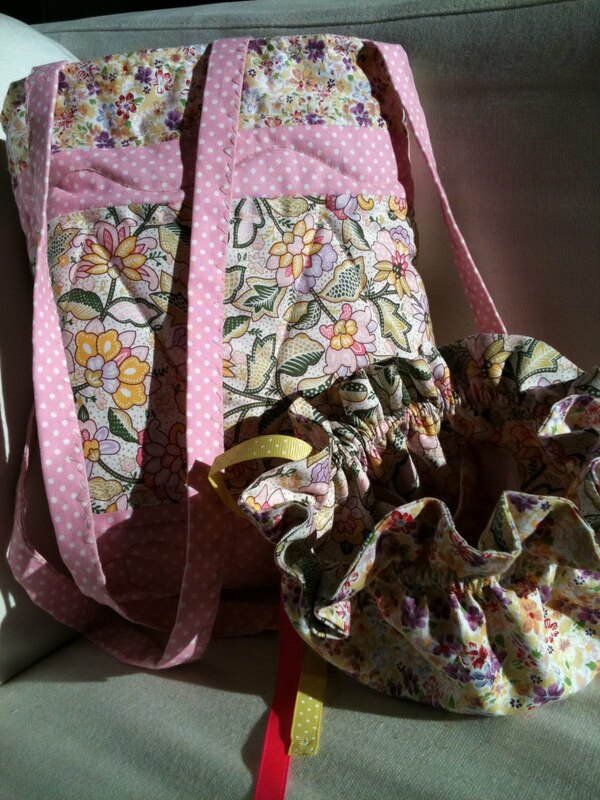 We had fun making it, and it was a good training, my first machine-quilting excersice.